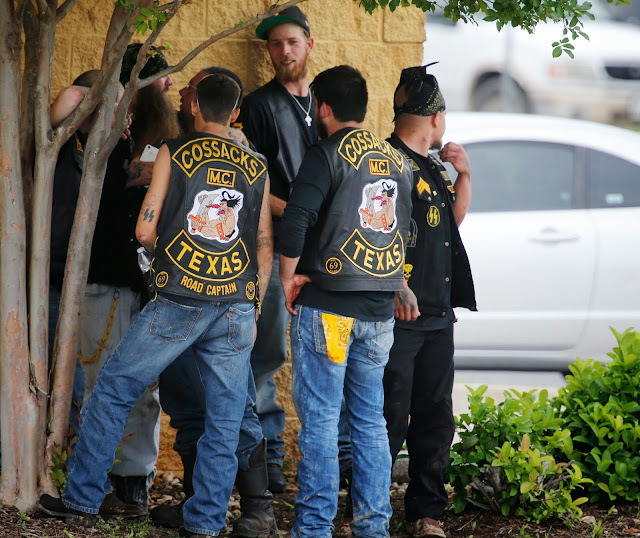 Make no mistake about it the claim of an actual bloody brawl by biker gangs in Waco, Texas, is a total fake. Nothing of any sort happened. It’s all staged, readily proven. It is easy to see that this is a real hoax. Supposedly, nine people died and 18 were injured. Nine and eighteen: interesting numbers. There is nothing real about it. The whole scene looks like a decided fake. Nothing is happening. There is no emergency. All the people are merely milling around. Does the Sergeant look like a reliable cohort? Does he seem to be upset about any real event where people were slaughtered in a bloodbath? Is his interview to the least degree believable? Who in the world thinks that he is representing a real event? 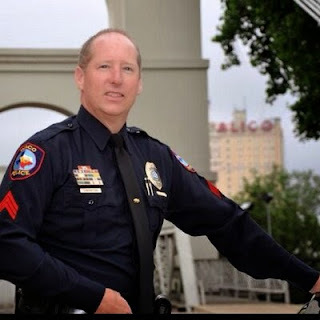 He says there were bullets flying around everywhere and that even police vehicles were shot out, that it was a shoot-out between gang members and the police. Clearly, he is merely acting. Is acting his second profession? He says there was “blood everywhere.” Does anyone see any blood? He said you can still see the bodies laying around. What’s more, this is all the police and the local media have to offer? He was setting people up for such staged imagery. There is no evidence that these are dead bodies, particularly victims of a bloody beating and also shooting. Moreover, if this was the case, why are they left there unattended? Do these images represent even the slightest degree of reality for a scene were “192 were arrested?” Where are the handcuffs, then, if these men are such dangerous characters who were responsible for a deadly public brawl? Do these men look any more believable than the previous photo? 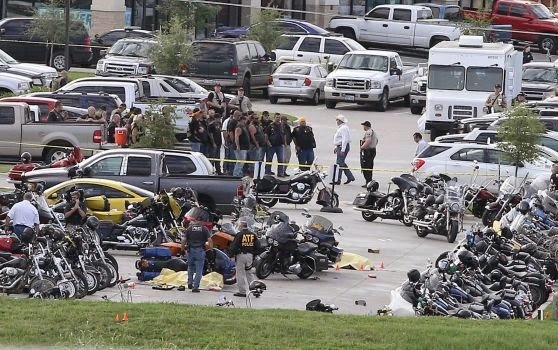 Where are those handcuffed and arrested 192 violent, brawling bikers? For the Israelis all it takes is two smirking Zionists. 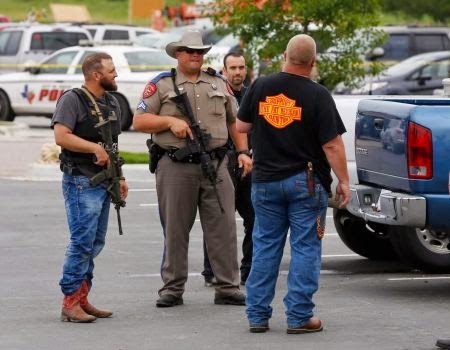 What about in regard to the bikers? 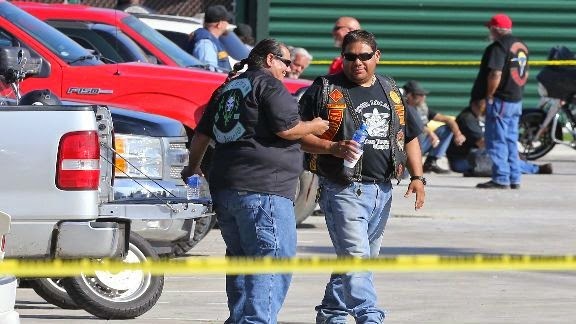 Are not two smirking biker ‘gang member’ smirkers and smilers not sufficient to confirm the arch-scam? 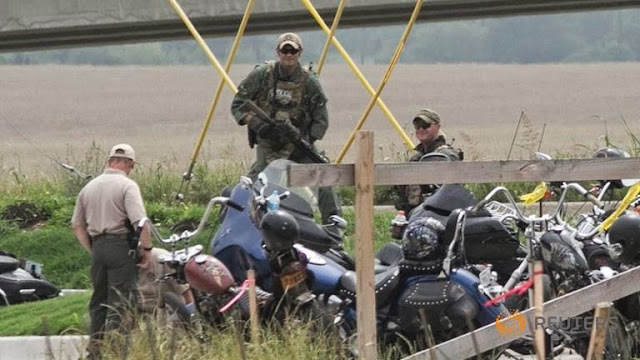 It’s all roped off for the biker cohorts of the federal criminal system, and in this image there are three smirking bikers – the one in the far background is also smiling. Once again, what about this is anything other than an arch-fake? These bikers are making a joke about the entire issue. What a most gratifying use of the taxpayer largess for the arch-Zionist DHS elements to put these bikers on the payroll. It is, after all, a focus point for arch-federal goons such as the gun-grubbing, anti-Constitution moles of the arch-antagonistic, anti-general public ATF. 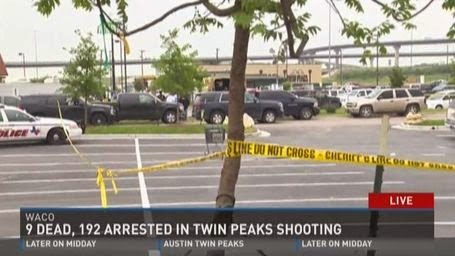 Where are the 9 dead and 18 wounded? 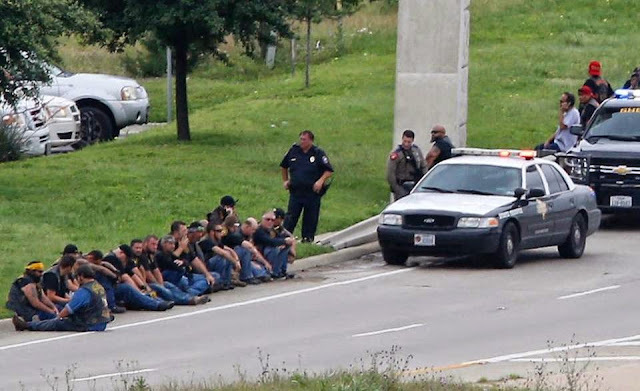 Moreover, where in the world are all these men who were supposedly arrested? No real arrests were made. Nor was anyone put in handcuffs for cause. Yet, the bikers are willing cohorts, as they have always, apparently, been, mere collaborators with the arch-Zionist federal system. There is no possibility that this was a real event, not in a million years.